Thanks Michel for this perfect answer to Vidar’s question. I’ve been away on a trade show this last week so haven’t had much time to look at the forum. In Vidars stair I’ve set the posts with no penetration into the posts. The newel posts are just marked with the string position and no assembly details.I usually advise to do this and then to add the assembly details by hand either on DXF files if using CNC or simply by drawing directly on the paper templates or even just directly onto the wood when marking out the parts. This enables the StairDesigner output to be used for mortise and tenon or bolted assembly. if you use version 6 there is no mortise on a stringer. I suppose you can correct this when you have the DXF files. You have to check the penetration depth you currently have for the stringer in the newel post. Based on this you can create your mortise . A typical recess is 25mm on top and bottom of the mortise. Do not forget to reduce the hole height in the newel post by 50 mm if you use this recess. Also the width needs to be adjusted to the mortise you make . Version 7 has this possibility build-in. I have a question about the stringer and the newelpost, should there be a mortise for the stringer in the newelpost or is this just the location of the stringer that is marked on the template. – in the DXF folder you have the 2D and 3D DXF of the whole stair and in the vidar01v02-parts sub folder all the DXF files of each part. The DXF files can be loaded into CAD like AutoCad or Draftsight (our recommended free CAD program) to add extra dimensions annotations etc. Here are your manufacturing files. I’ve tweaked a bit your stair. I’ve added a landing step and posts and also adjusted the winders. I attach a couple of models, one with curved strings vidar01v02 and one with straight strings vidar01v01. Straight strings are easier and faster to make but curved are more elegant. You can adjust these models to your specifics. I think you decision very wise, always better to walk before you run or you might find yourself with a broken leg. With the right advice and if taken slowly with thought you’ll be able to produce a good quality first time stair. 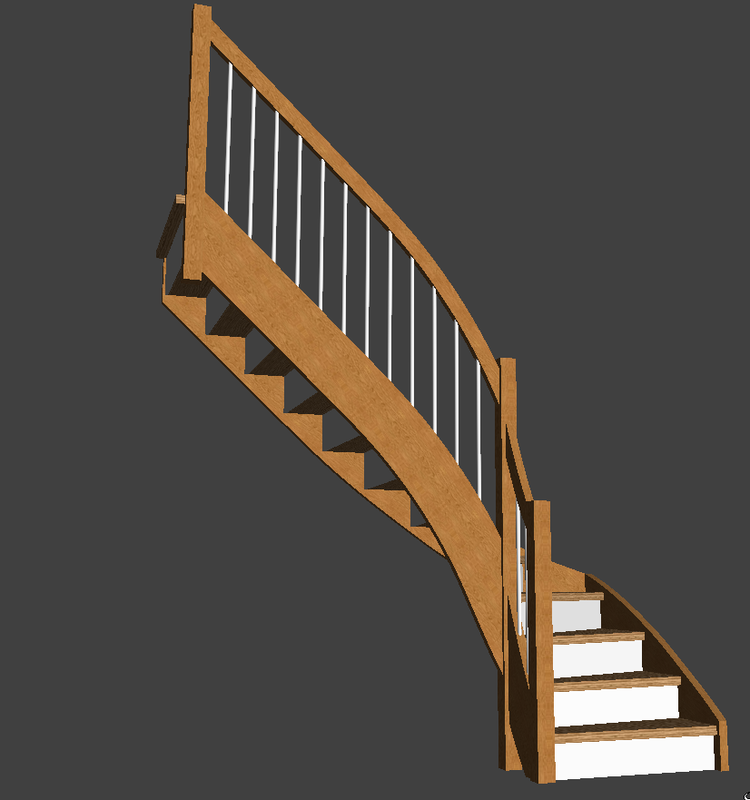 To understand you step problem can you post the StairDesigner file? I am a professional carpenter and have a little Company that i run, do mostly remodeling and Extensions and garages and similar jobs, i do get some requests from time to time if I can make a stair. But i havent felt sure if i could pull it of or not, I want to deliver a Product i know is of good quality and craftmanship. 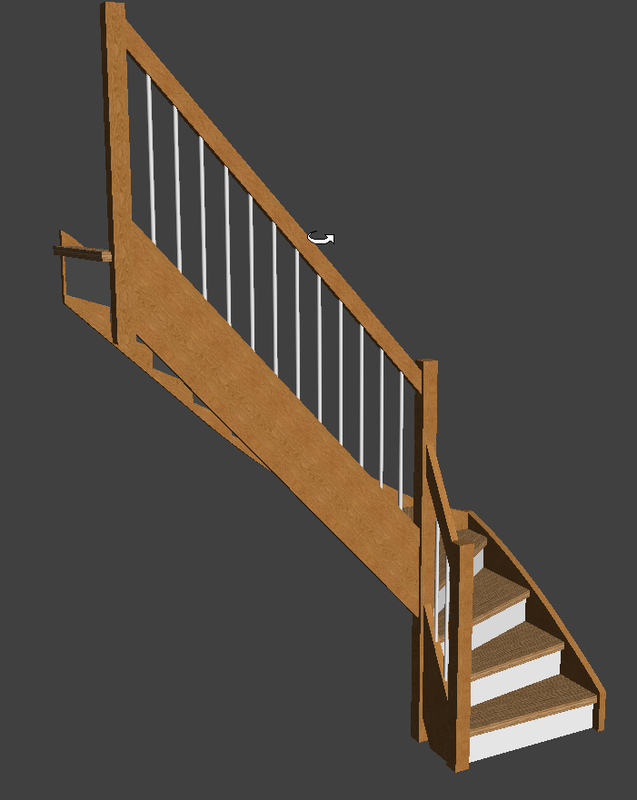 So I want to try build a stair in my own house and see how it goes and take it from there. I think I have to save the curved stringer for another Project dont want to start in to deep water . I have tried to put my measurements in stair designer but i get a Message some of the treads are outside the stringer. These are nice looking stairs. Strings could be made using my horizontal laminates and then tradition laminates used to make the curved handrail. However these guys are seasoned professional carpenter stair builders. In these projects there are many tricky details to deal with that will require intensive coaching for a first time stair builder. So be warned if you decide to go ahead although not impossible, this will be a long and head scratching endeavour that will require a lot of patience and effort. I don’t know your wood working experience but generally speaking I would advise that you have the help of a seasoned carpenter with eventually some stair building experience, this with our online coaching and services would probably be the best way to go. 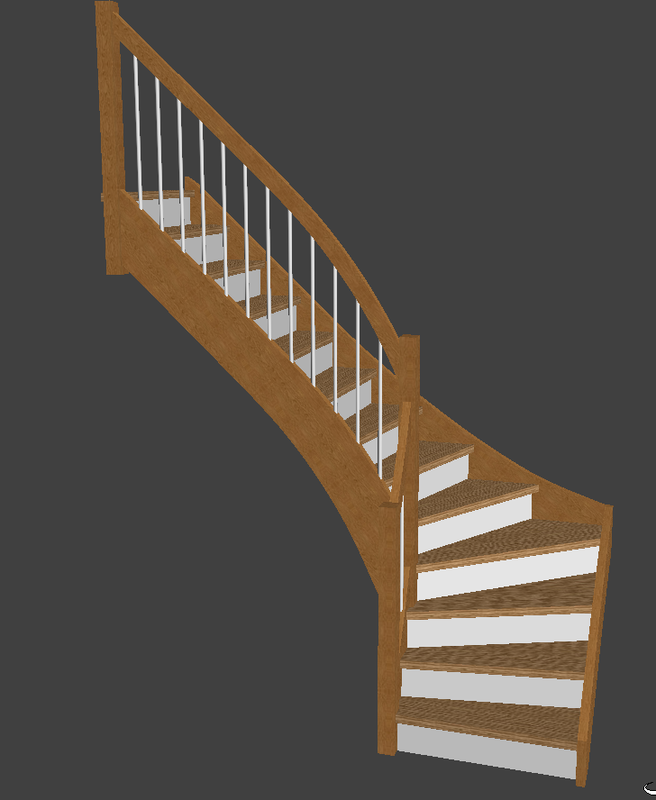 I would say that this type of stair for a beginner could take up to 5 times the time to build than a simpler stair with posts. So it’s up to you to decide if you think you have the patience and the attention to detail necessary. I have some 42 mm stringers in pine i will Paint white and try too dye or varnish some oak for the treads to match the Wood flooring and some steel balusters With either white or oak handrail. Curved strings are much more complex to build and although not impossible for a first time stair will certainly require one to one coaching and much longer to complete. Can you post some photos of the sort of stair design you are thinking of?